Is there any way to get the menu more flattened? Right now it's kinda annoying because almost EVERYTHING is under accessories. you should go to the welcome screen (if your welcome screen is not in your applications menu, you should type: sudo kwriteconfig --file '/usr/share/applications/q4os-welcome-screen.desktop' --group 'Desktop Entry' --key 'NoDisplay' 'false' in a terminal to make it appear). Then, choose the menu item, then choose your type of menu (bourbon, kickoff or classic) and on the righthand side, choose categories (instead of q4os) for the menu structure. OH, that is soooooooooooooooooooooooooooooooooooo much better. That billion clicking for every program was so totally getting on my nerves!! 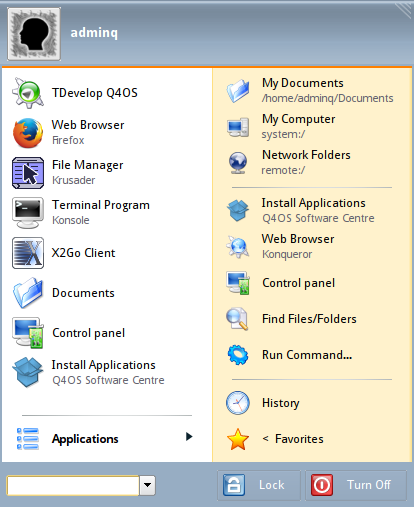 I found it quite annoying when I started using Q4OS, but I guess I have just grown accustomed to it now. And an easier way to access the welcome screen might be to right click the desktop and select "Run Command" and then type welcome-screen.exu although it should show in the drop-down after typing a few characters. In addition, if you use 'Bourbon' or 'Kickoff' menu, we suggest you to add favorites shortcuts into the left panel of the Bourbon menu to be easily accessible, please see the picture attached. Oh, not sure if I'd need to customize the right side, good to know that it's possible. I've added the favorites on the left already, that I had done first thing.